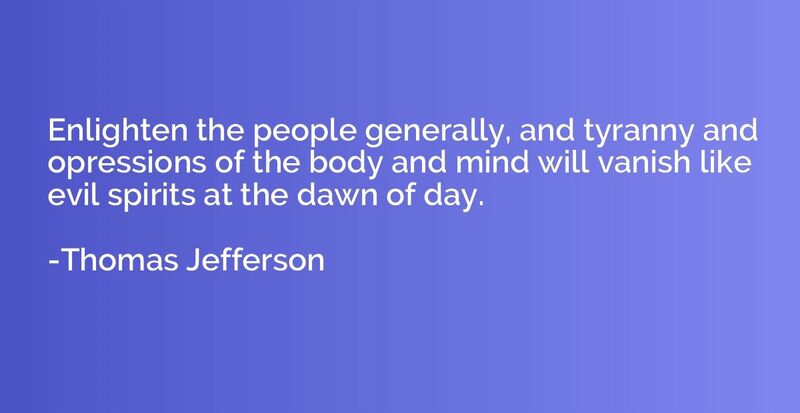 Enlighten the people generally, and tyranny and opressions of the body and mind will vanish like evil spirits at the dawn of day. 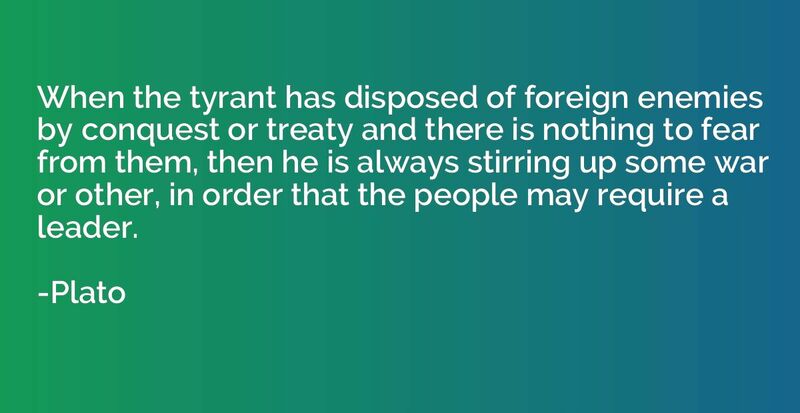 When the tyrant has disposed of foreign enemies by conquest or treaty and there is nothing to fear from them, then he is always stirring up some war or other, in order that the people may require a leader. 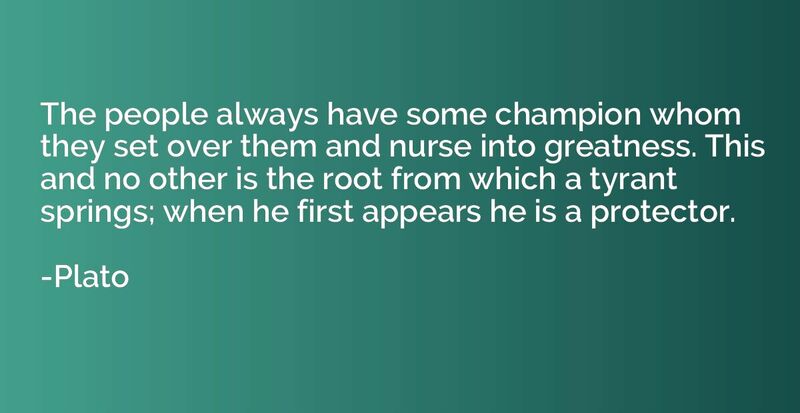 The people always have some champion whom they set over them and nurse into greatness. 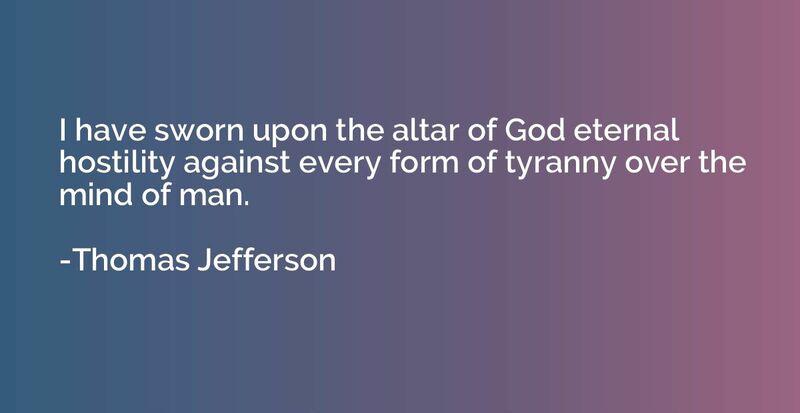 This and no other is the root from which a tyrant springs; when he first appears he is a protector. 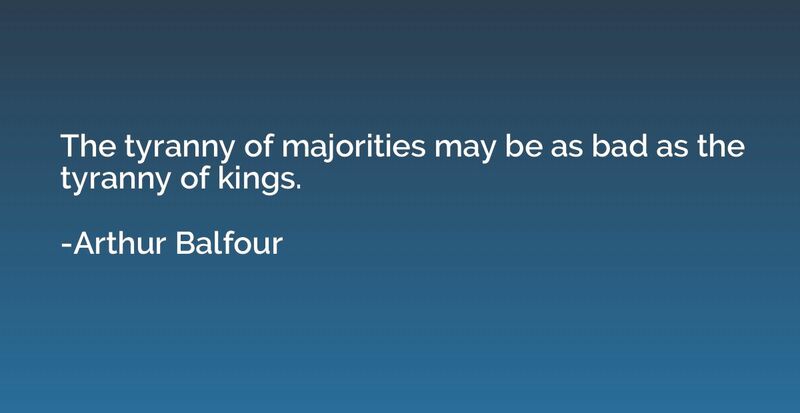 The tyranny of majorities may be as bad as the tyranny of kings. 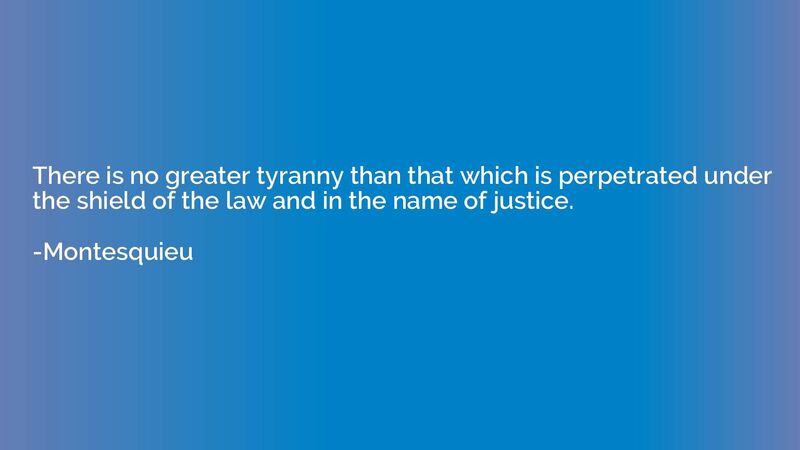 The common good of a collective -- a race, a class, a state -- was the claim and justification of every tyranny ever established over men. Every major horror of history was committed in the name of an altruistic motive. Has any act of selfishness ever equaled the carnage perpetrated by disciples of altruism? Does the fault lie in men's hypocrisy or in the nature of the principle? 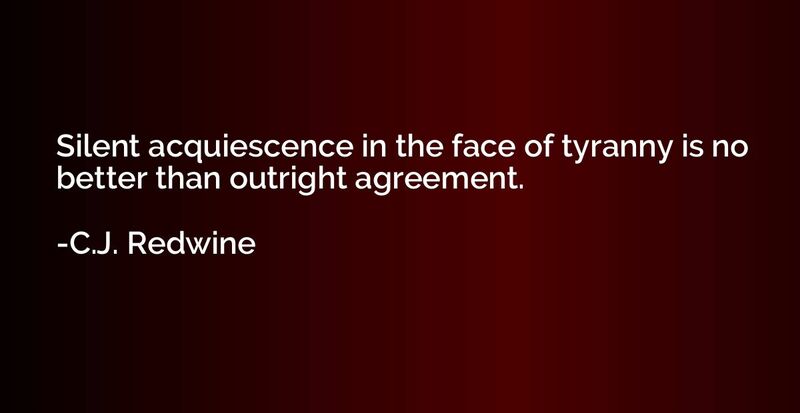 The most dreadful butchers were the most sincere. 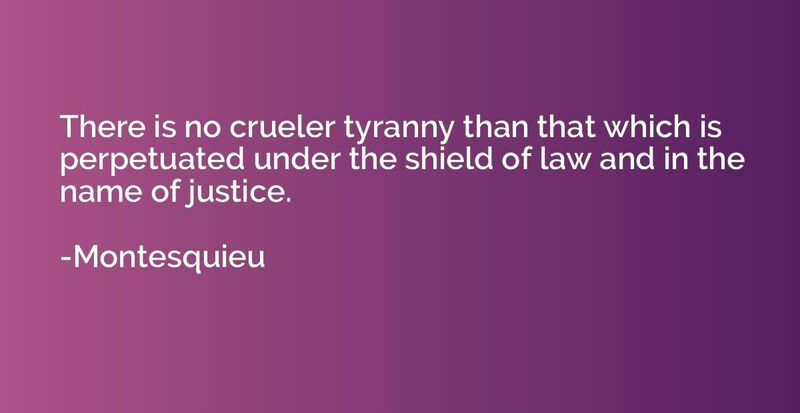 The believed in the perfect society reached through the guillotine and the firing squad. Nobody questioned their right to murder since they were murdering for an altruistic purpose. 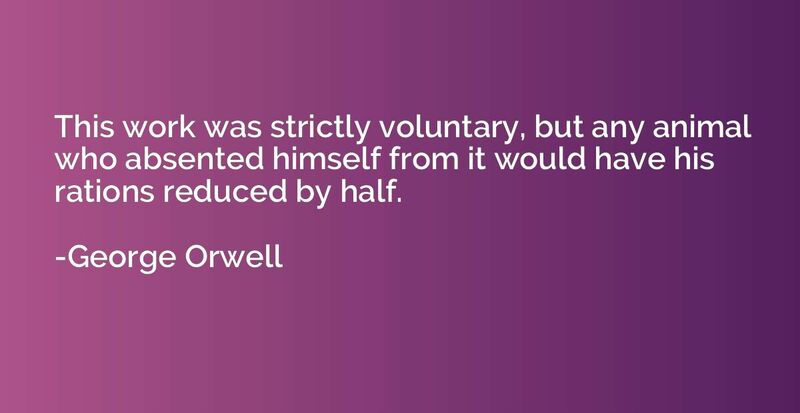 It was accepted that man must be sacrificed for other men. Actors change, but the course of the tragedy remains the same. 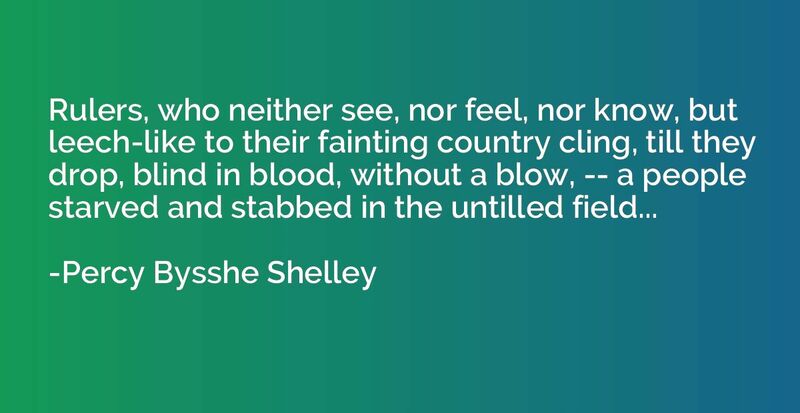 A humanitarian who starts with the declarations of love for mankind and ends with a sea of blood. It goes on and will go on so long as men believe that an action is good if it is unselfish. That permits the altruist to act and forces his victims to bear it. 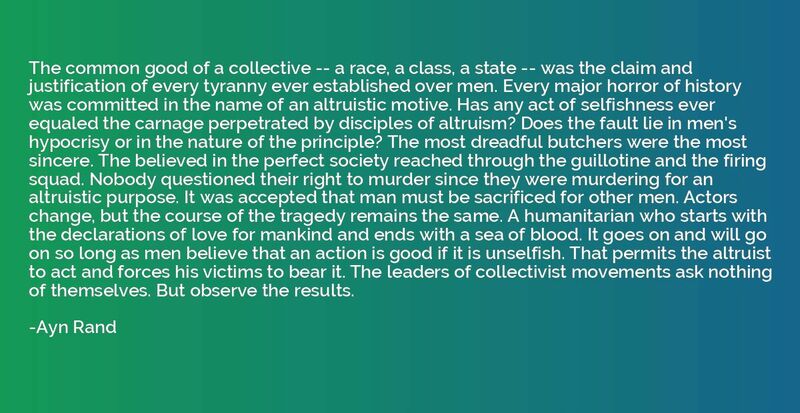 The leaders of collectivist movements ask nothing of themselves. But observe the results. 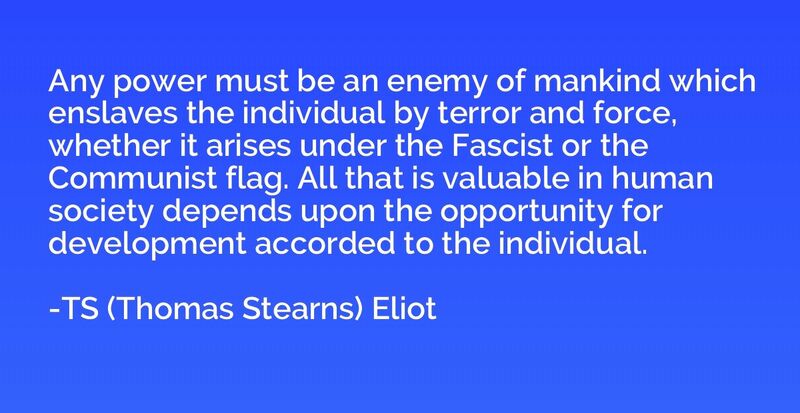 Any power must be an enemy of mankind which enslaves the individual by terror and force, whether it arises under the Fascist or the Communist flag. 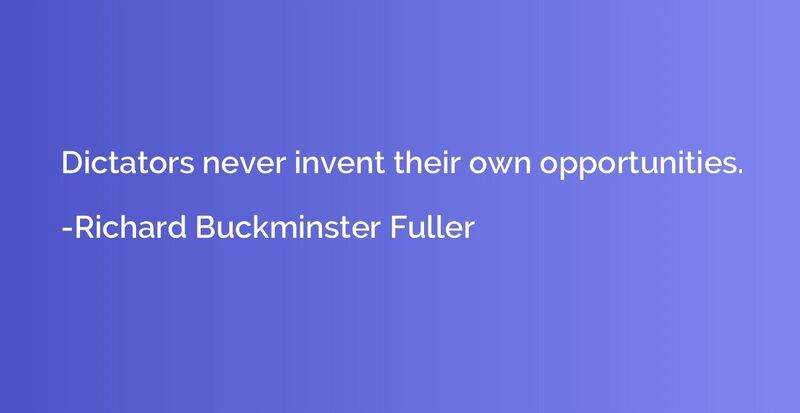 All that is valuable in human society depends upon the opportunity for development accorded to the individual. 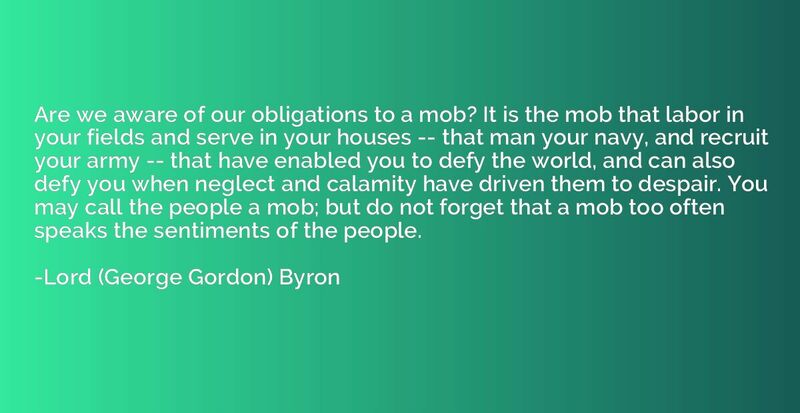 Are we aware of our obligations to a mob? 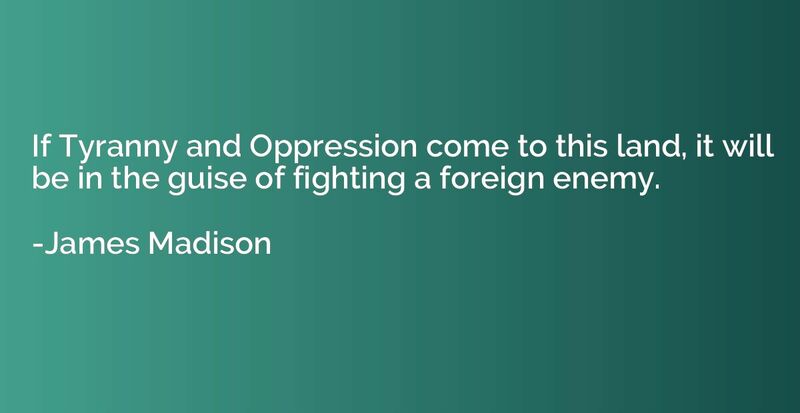 It is the mob that labor in your fields and serve in your houses -- that man your navy, and recruit your army -- that have enabled you to defy the world, and can also defy you when neglect and calamity have driven them to despair. 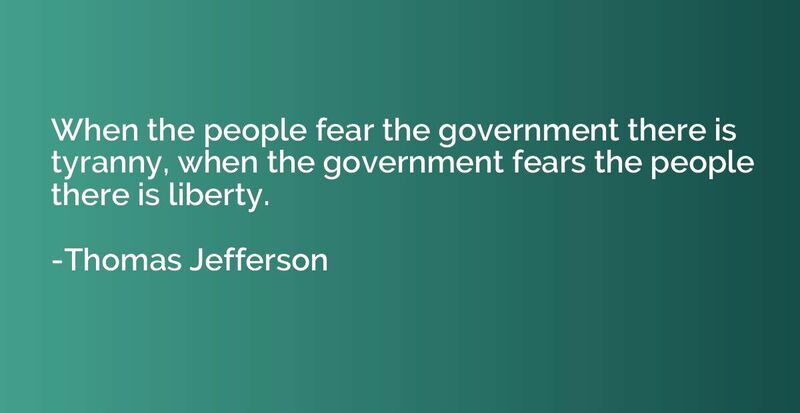 You may call the people a mob; but do not forget that a mob too often speaks the sentiments of the people. 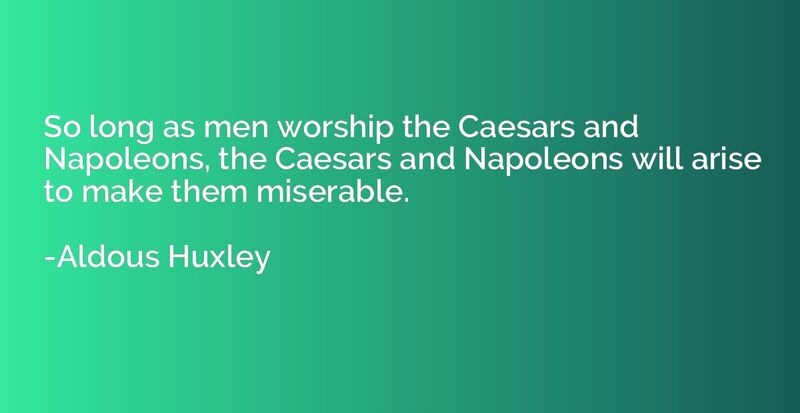 So long as men worship the Caesars and Napoleons, the Caesars and Napoleons will arise to make them miserable. 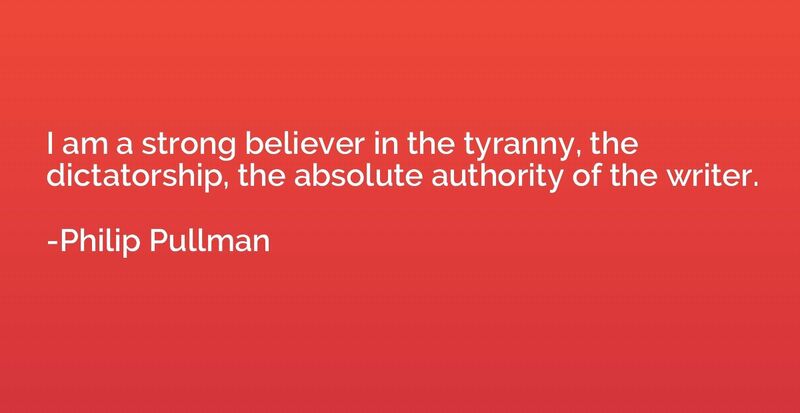 I am a strong believer in the tyranny, the dictatorship, the absolute authority of the writer. I know not why any one but a schoolboy in his declamation should whine over the Commonwealth of Rome, which grew great only by the misery of the rest of mankind. 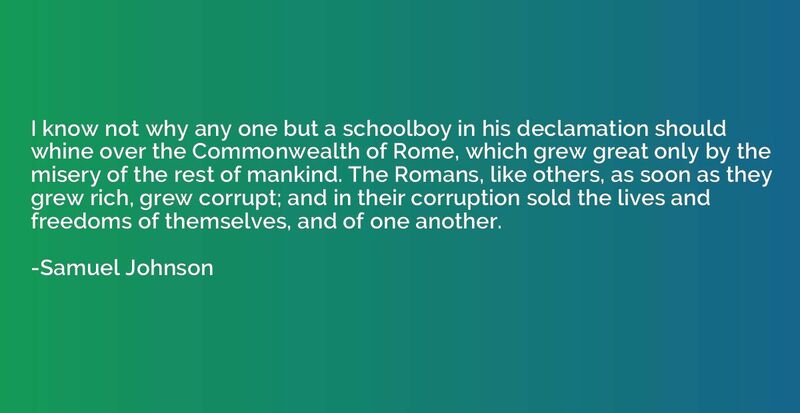 The Romans, like others, as soon as they grew rich, grew corrupt; and in their corruption sold the lives and freedoms of themselves, and of one another. 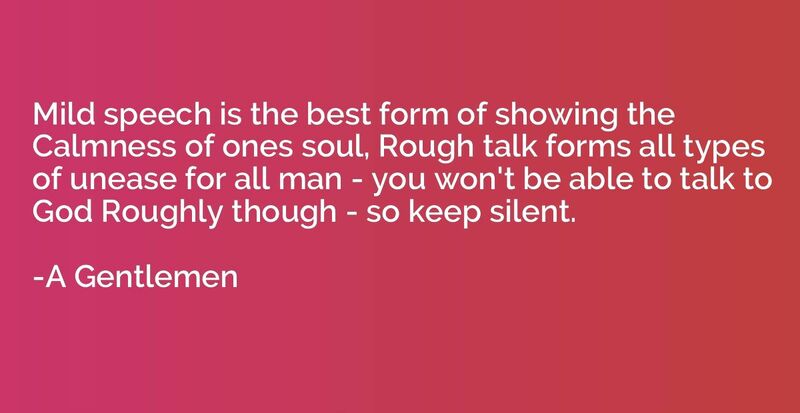 Mild speech is the best form of showing the Calmness of ones soul, Rough talk forms all types of unease for all man - you won't be able to talk to God Roughly though - so keep silent.